On a New York Yankees team chock full of all-time greats, it is easy to see how even a pitcher as impressive as Whitey Ford might get lost in the shuffle. He still holds several Yankees records but yet his legacy as a Yankee great can sometimes get overshadowed by the many legendary hitters for the franchise. On the flip side, Ford's trading cards were attention grabbers from his very first appearances and although it might be difficult to compete with a legendary rookie card, this list of the best Whitey Ford cards combs through his most memorable and valuable options from throughout his playing days and beyond. Whitey Ford was born in Queens, New York and it seemed destined from the start that he would be a member of the New York Yankees. He famously began his pitching career 9-0, which helped him become the pitcher with the highest winning percentage over the course of his career at .690. Also getting off a to a fast start in the hobby, Ford was selected as the leadoff card in the 1951 Bowman set. 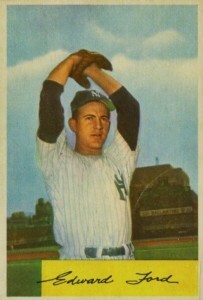 Ford is still the Yankees' most successful pitcher with 236 wins and he is often included in modern sets and even some sets devoted just to Yankee players. You can find base cards for him in both the 2013 and 2014 Topps Allen and Ginter sets as well as 2014 Topps Stadium Club. With a career ERA of .275, Whitey Ford holds the second-lowest all-time mark behind only current Los Angeles Dodgers ace Clayton Kershaw. Although Ford and Kershaw haven't been featured together on a baseball card yet, a dual autograph featuring Ford and Yankees legendary closer Mariano Rivera is available in 2015 Topps. 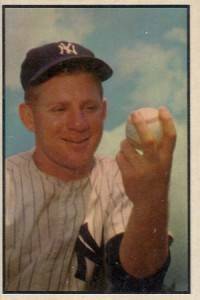 Another player combo card that needs to happen is a pairing of Ford and Mickey Mantle. The former teammates were elected to the Baseball Hall of Fame together in 1974. Because Ford's playing career coincided with the rapid increase in value for vintage baseball cards, it is easy to put to put too much of an emphasis on card price with Whitey Ford's cards because literally every one is valuable. This top list takes a look at Ford's full career and finds the cards that represent a full retrospective of his best appearances on cardboard. After an injury-shortened 1966 season, Whitey Ford had surgery on his pitching shoulder and attempted a comeback in 1967. He did not fair too well and retired only a month into the season. This makes his 1967 Topps card his last appearance on a baseball card as a player and an important card to include in any Ford collection. 1962 Topps included a nine-card series of In Action cards that feature superstars like Roger Maris, Warren Spahn, and Harmon Killebrew doing what they do best. 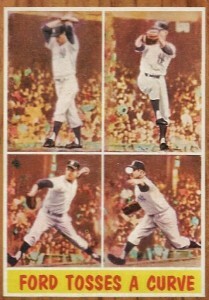 "The Ford Tosses A Curve" card shows him pitching over four photograph panels and it is a rare example of in-game photography used in a pre-1971 Topps set. While known for his fastball, Ford was also a master at the curve which gave him precise control of his pitches. 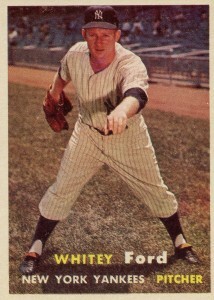 Unless you are already a Whitey Ford collector, you may not have noticed that in many of Ford's Topps cards he takes the same pitching position. This generally includes an empty left hand, outstretched, as he has just completed throwing the ball. You'll see this same sort of stance in his 1959, 1962, 1964, and 1966 Topps cards. I would recommend picking up his earliest instance of this pose in 1957 Topps as it also features his first full-color photograph Topps card. Although you can find sticker autographs for Whitey Ford in some recent high-end products, he is not a prolific signer. In fact, many recent products from Panini and Leaf feature Ford cards with cut autographs made from other photos, checks, or letters where he previously added his signature. 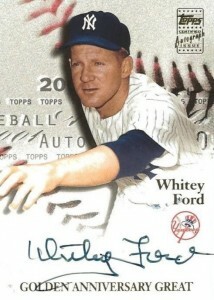 In order to find an on-card, certified autograph of Whitey Ford, you'll have to go back a few years. Featured in the set that honors Topps' 50th Anniversary, the 2001 Topps Golden Anniversary autograph cards offer a large and well-designed autograph space. 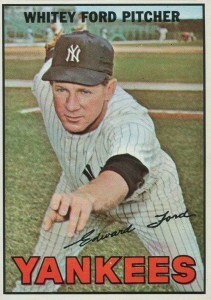 Whitey Ford's 1954 Bowman cards features the signature line of his full name "Edward Ford." He received the nickname "Whitey" during his minor league days based of his blonde and almost-white hair. 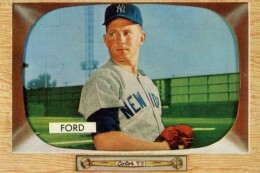 During his decade plus as the Yankeess ace, Ford would also often be called the "Chairman of the Board," a nickname he would share with Frank Sinatra. When constructing a Whitey Ford collection, its important to include cards that highlight his World Series dominance. Ford still holds the record for most World Series victories at ten and is the only pitcher to start Game One of the World Series four straight times. Making that feat all the more impressive is that he actually did it twice. The first four Game One starts came during a stretch from 1955 to 1958 and then he added another streak from 1961 to 1964. 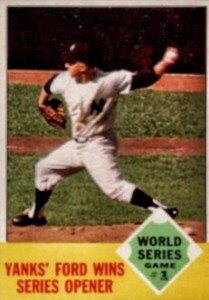 Ford's 1963 Topps card showcases his Game One win from the 1962 World Series against the San Francisco Giants. 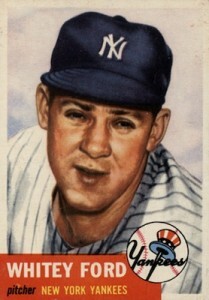 Starting with his appearance in the 1953 set and extending to his retirement in 1967, 1955 was the only year that Ford didn't have a regular-issue Topps card. He did appear in the famous 1955 Bowman set featuring the TV design and this card tops the value list among pitchers in the set. If you can picture Whitey Ford, there's a good chance that this image of him springs to mind first. People may not realize that the shot of a smiling Ford, holding a baseball, originates from the 1953 Bowman Color set because the simple release does not include anything on the front of the card other than the black-framed photograph. Like many players in the 1940s and 50s, Whitey Ford lost two seasons of his career to military service. Ford served in the Army during the Korean War and missed the entire 1951 and 1952 seasons. This kept him out of the 1951 and 1952 Topps sets. For buyers who exclusively collect Topps, it puts added weight and value on Ford's 1953 debut even though it arrived a few years after his true rookie card. 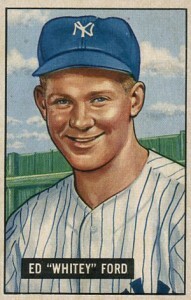 Before Whitey Ford's appearance in 1951 Bowman, the first card in the Bowman Baseball sets were given to Bob Elliott, Vern Bickford and Mel Parnell. While all three were rookie cards, they just didn't have the staying power and reputation that Ford commanded. Prices for highly-graded version of Ford's earliest card, which are very rare, can reach as high as several thousand dollars. 1954 Topps # 37 - WHITEY FORD - PSA 3 VG - HOF - New York Yankees - Nice! If you are talking about the All-Time Record Holder card, those sell for about $1.